Rooted in tradition, this elegant boutonnière is created with an orange and blush ranunculus bloom paired with eucalyptus seeds and a black ribbon leaf cinched with champagne-hued French satin ribbon. $14.50, XO Bloom in Los Angeles and Westlake Village. Chic and lush, this mix-and-match set features a boutonnière consisting of a yellow garden rose and bud accented with greens, baby limes and berries, set alongside (on right) a lapel decoration of a purple allium bullet accented with succulents, greens and berzillia berries. $20 each, from Stella Bloom Designs in Ventura. Perfect for a whimsical wedding, these boutonnières are handcrafted from premium cardstock paper and gently brushed with watercolor to create a natural appearance. For one-of-a-kind looks, this delicate peach anemone with sage green center, and the purple pansy, with its shimmering ivory center, are just the ticket. Best of all, they’ll live on forever. $15 each, from The Bleu Dahlia in Tustin. Spice up the groom’s party with Mark’s Garden sunset-hued boutonniere set. Perfect for a vibrant outdoor wedding, the trio includes (from left) a small, red striped Fire Flash rose, a coral textured Jatropha rose with freesia and a yellow Cordata ranunculus. $20 each, from Mark’s Garden in Sherman Oaks. 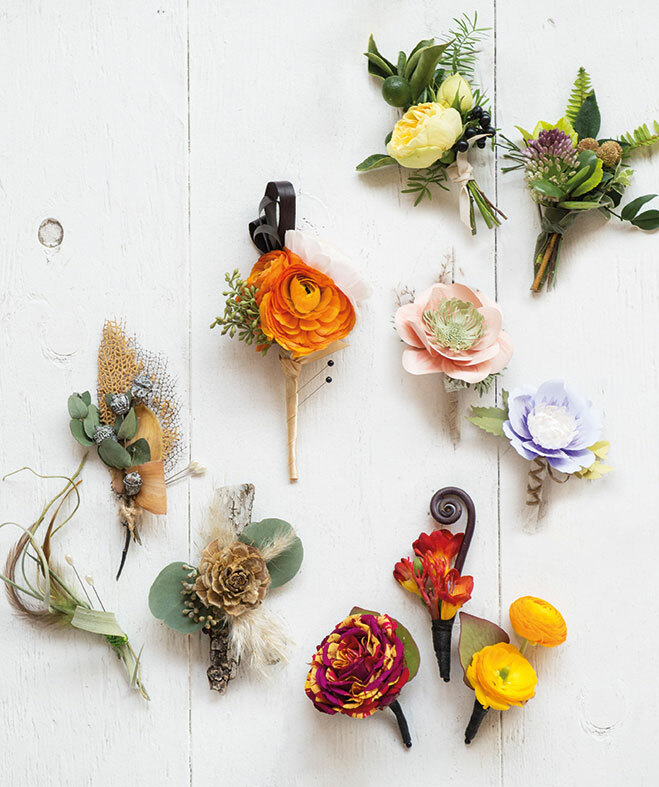 This eternal boutonnière group features (from left) one with air plant tendrils and a golden ostrich feather, tied with green threading; one made of a sea fan coral with eucalyptus leaves and pods; and one of a birch bark sliver intertwined with wood flower, silver dollar eucalyptus and natural grass. Price upon request from Lilla Bello in Santa Monica. While Sammy Ng and his fiancée were gathering headshots of their bridal party for their wedding website, he hit upon an idea: gifting each groomsman a customized glass. Spoiler alert: He doesn't have to match his groomsmen. From formal navy tuxedos, to eye-catching colbalt three-pieces, Friar Tux has chosen a few of their favorite looks using the signature hue, and even given us a breakdown of exactly how to achieve each look.